August 5, 2016 February 11, 2018 cheesevikinggamesLeave a Comment on Now What? Super Fighting Robot is done and submitted to the 2016 Solitaire Print and Play Contest. The game’s complexity got away from me a little bit, but I’m proud that I finished it within the deadline. It was an excellent learning experience. You can download and construct it for yourself here or on the official Board Game Geek Super Fighting Robot game page! That’s right! Super Fighting Robot is now officially in the Board Game Geek database along with my designer page and the CheeseViking Games publisher page! If you’re a user, be sure to bookmark these pages for future changes, news, and games! If Super Fighting Robot is well received during the contest, I’ll put effort into professional art and graphic design and then start marketing the game. If the design turns out to be unpopular, I’ll put it on the back-burner and consider some changes. There’s always different things to focus on. Speaking of, I’m excited to announce that in addition to working on Super Fighting Robot the past few months, I’ve also solidified my design partnership with long time friend and founder of Coalition Game Studios, Mike. Mike and I have been finishing the details on 2 games that are in final iteration and almost ready for publishing! One is a party game designed to accommodate a large number of people easily. It’s a creative, think on your feet word game where you have to try to sneak words into a sentence. We’re split on the theme and name but once that’s resolved it’s just a matter of sourcing some artwork and getting manufacturing quotes. Our other game near completion could be considered to be on the opposite end of the gaming spectrum. “Sphinx” is a 2 player only “I pick, you choose” game about splitting cards and playing them into piles. You score the most points by not being able to play a card into 1 of your piles. 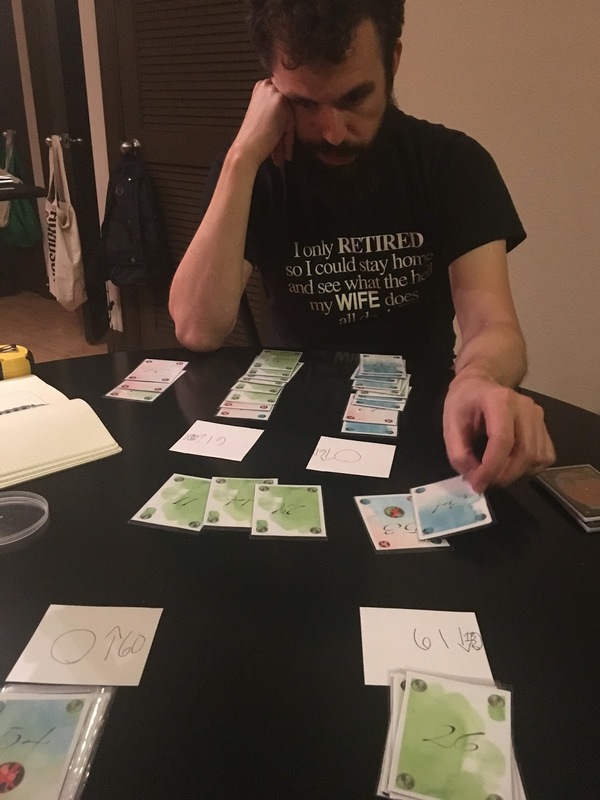 It’s a bit tricky to get the hang off and we have some scoring wrinkles to iron out, but the game is fun, challenging, draining, and pretty rewarding of good play. I’ve already got some manufacturing quotes in place for this one and have started talks with artists. It’s pretty exciting to have something so close to being ready! Both these games will be added to Board Game Geek under CheeseViking Games in the coming months! These two games also have the best chance of being our first crowdfunding attempts in early 2017! Finally, my latest idea is Bake It!, a game themed around competitive baking. 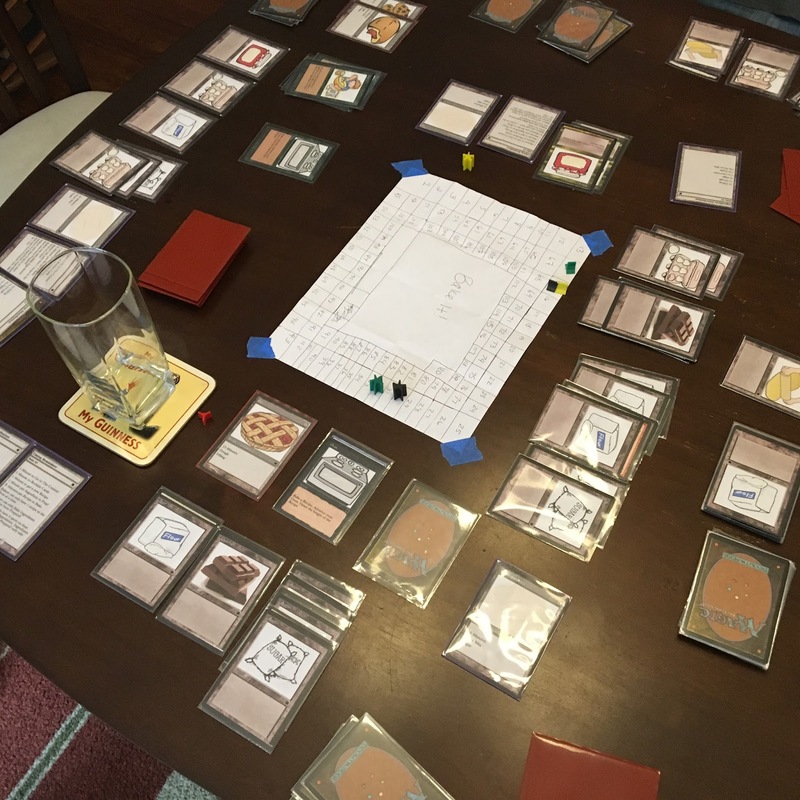 I hammered out a quick prototype this week and got a practice game in with family. The simultaneous play and timing mechanics are on the right track, but I need to make some massive adjustments on how combining ingredients works. Bake It! is a fresh take that combines several of my ideas from Zookeeper, Great Barrier Reef and Transylvania Pizza Kitchen and adds a more universal theme. It’s funny how designs evolve and borrow bits and pieces from the ones that weren’t quite there. First prototype for Bake It! This will be a fun one to chronicle its progress!